The Great Smog that affected London in 1952 resulted in the death of about 12,000 people from respiratory diseases. 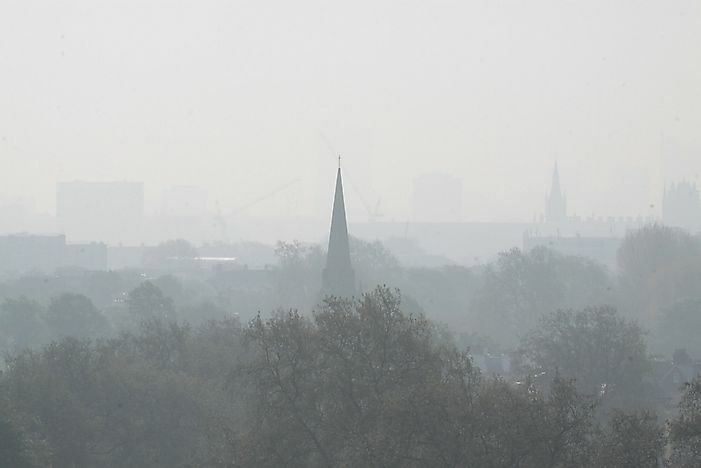 Smog in London as observed from Primrose Hill. Smog, a kind of air pollutant, is composed of a mixture of compounds like nitrogen oxides, ozone, sulfur oxides, smoke or particulate matter, CFC’s, carbon monoxide, etc. The primary sources of the air pollutants comprising smog are derived from power-producing plants, domestic emissions, forest fires, automobile emissions, etc. The effects of smog include breathing problems, coughing, wheezing, respiratory diseases, etc. Smog was common in London as the people were burning more coal than it was required due to cold weather conditions. The poor quality of coal increased the presence of sulfur dioxide in the air. Most of the coal power stations situated in Bankside, Fulham, and Kingston-upon-Thames also added to the pollution in the air. The Great Smog or the Big Smoke affected London in the month of December in the year 1952 because of severe air pollution factors. A thick layer of Smog formed over the city due to anticyclone and the windless conditions that collected airborne pollutants derived from the usage of coal. The smog left more than 100,000 people ill, the death toll reported around 12,000 people. The Coal Smog appeared in the year 1880, and nearly 2,200 people died. The people experienced Coal Smog during Industrial Revolution and the main factor was the over usage of coal as 90% of the houses were burning coal and letting out this toxin from their chimneys. The Smog experienced in the year 1991 in London was caused due to traffic exhausts, nitrogen oxides, and other particles. They are not visible to the naked eye, but penetrated deep into the lungs of people and caused some 160 deaths. The pollutants from the factories caused the Meuse Valley Smog in the year 1930 in Belgium, which caused shortness of breath amongst the people. The other factors reported were coughing fits, rapid breathing, nausea, vomiting, etc. and the death toll was around 60 people. Donora Smog occurred in Donora, Pennsylvania reported in the year 1948. It reduced the visibility, caused respiratory damage, fluorine poisoning and asthmatic breathing that resulted in the death of 50 people.